Gemini Data Loggers (UK) Ltd. is a registered producer of Electrical and Electronic Equipment in the United Kingdom (registration number WEE/EE0074UR/PRO). Our products fall under category 9 (Monitoring and Control Instruments) of The Waste Electrical and Electronic Equipment (WEEE) Regulations. We take all environmental issues seriously and fully comply with the requirements for collection, recycling and reporting of waste products. The equipment was supplied before 13th August 2005 that has been directly replaced by Gemini products manufactured since 13th August 2005. Gemini products supplied after 13th August 2005 can be identified by the wheeled bin symbol. Under Gemini's Terms and Conditions of Sale, customers are responsible for the cost of returning WEEE to Gemini and we are responsible for the costs of recycling and reporting on that waste. Ensure that the WEEE meets one of the two conditions above. Remove any batteries otherwise the waste will need to be returned in accordance with the regulations for transporting data loggers with lithium batteries. Download, print and complete the WEEE Return Form and attach it to the package in a document wallet. 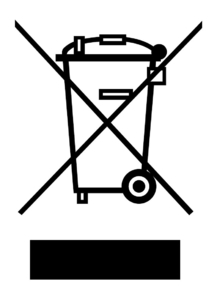 Return the WEEE to Gemini using a licensed waste carrier. In accordance with the regulations, customers outside the United Kingdom are responsible for WEEE. As a distributor of batteries Gemini Data Loggers (UK) Ltd. will accept old batteries back from customers for disposal, free of charge, in accordance with the Battery Directive. PLEASE NOTE: All lithium batteries MUST be packaged and returned in accordance with the relevant regulations for transporting lithium batteries. A licensed waste carrier must be used for transporting all waste.